Das Buch "Lectures on Technique" von Melanie Klein wird zurzeit von unserem Mitglied Dipl. Psych. Antje Vaihinger übersetzt und im Laufe des Jahres 2019 im Psychosozial Verlag herausgebracht. Lectures on Technique by Melanie Klein is based on a series of six lectures given by Melanie Klein to students at the British Psychoanalytical Society in 1936 and repeated several times in subsequent years. They were discovered in the Melanie Klein Archives housed in the Wellcome Medical Library and have been previously described by Elizabeth Spillius but never before published. In this book, John Steiner explores what characterises Kleinian Technique, how her technique changed over the years, what she saw as the correct psychoanalytical attitude and how psychoanalytic technique has changed since Klein’s death. Melanie Klein, who moved to England from Berlin in 1927, became one of the leading psychoanalysts, following Freud and making an important contribution in the theory and practice of psychoanalysis. A pioneer in child analysis, her work remains widely influential throughout the world. This book consists of the full text of the original six lectures, accompanied by a critical analysis from John Steiner who is known internationally as a leading Kleinian analyst and writer. Steiner demonstrates the importance of the lectures in understanding Klein’s work and their continued relevance for contemporary psychoanalysis. In addition, also published for the first time, this book includes annotated transcripts of a preserved recording of a seminar Klein held in 1958 with young analysts of the British Psychoanalytical Society. In this seminar, close to the end of her life, many of the points made in the earlier lectures were elaborated upon and brought further up to date in light of developments in Klein’s thinking during the intervening years. 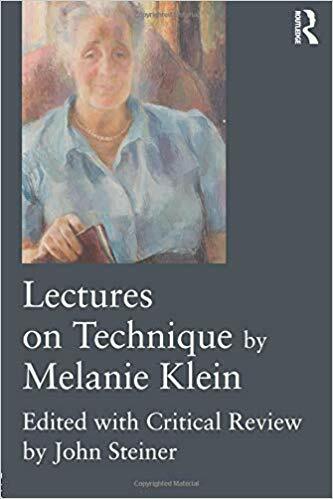 Featuring rare, previously unpublished material, Lectures on Technique by Melanie Klein provides a new and significant contribution to understanding of the Kleinian paradigm. It will be essential reading for all psychoanalysts and psychoanalytic psychotherapists interested in and influenced by Klein’s work and legacy. Das Buch "The Origins of Love and Hate" von Ian Suttie wird zurzeit von unserem Mitglied Dr. med. Rainer Rehberger betreut. The Origins of Love and Hate has long had an underground reputation within psychoanalysis. It is one of the most passionate arguments for a therapeutic practice based on the physician's love for the deeply deprived patient. It also advocated a view of human nature congruent with the findings of modern biology - a more optimistic vision than that of traditional Freudian psychology. The book is a powerful and early critique of the dual instinct theory of psychoanalysis - Eros and Thantos.